The cruiser bounced off a pickup truck, struck a utility pole, and continued on to hit a tractor-trailer. 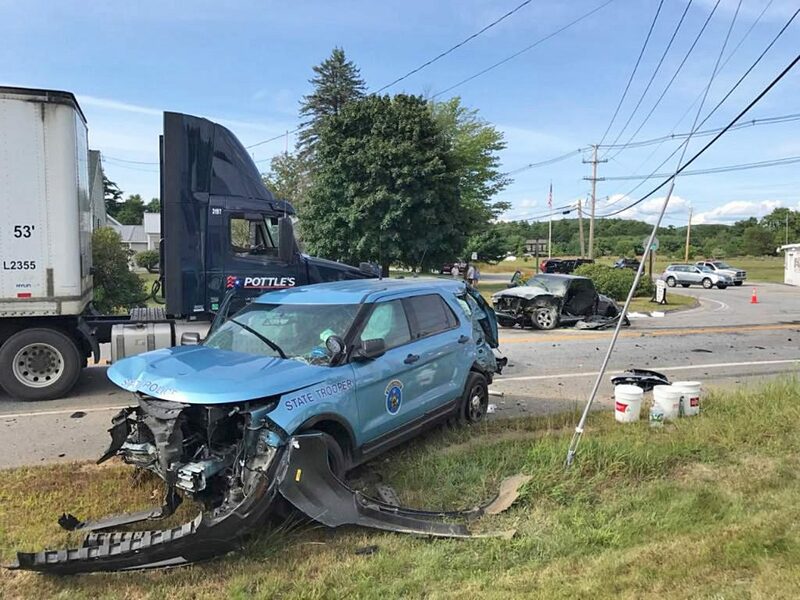 A Maine state trooper was being treated for cuts and bruises Monday after his cruiser was demolished in a crash in Casco. Maine State Police spokesman Stephen McCausland said Cpl. Joseph Bureau was taken by ambulance to Maine Medical Center in Portland to be checked out, but his injuries were not considered serious. Bureau was driving through the intersection of routes 121 and 11 in Casco when his cruiser hit a pickup truck that had entered the intersection. The flashing lights and siren on Bureau’s cruiser were activated at the time. He was responding to a report of a burglary in progress in the town of Brownfield. The driver of the pickup truck was flown by LifeFlight helicopter to Maine Medical Center with serious injuries. His name has not been released yet, pending notification of his relatives. Following the crash, Route 11 – also known as Poland Spring Road – had to be closed to traffic from its intersection with Quaker Ridge Road to Route 121. That section of road was still closed at 6:45 p.m. According to McCausland, the police cruiser bounced off the pickup truck before striking a utility pole. The cruiser continued on and hit a stopped tractor-trailer truck. The driver of the tractor-trailer truck, which is owned and operated by Pottle’s Transportation, was not hurt. “He saw the crash happening and came to a complete stop,” McCausland said of the truck driver. The cause of the crash remains under investigation by the Cumberland County Sheriff’s Office. The Cumberland County Regional Communications Center said it started receiving calls about the crash at 3:09 p.m. The Casco Fire Department, local ambulance crews and sheriff’s deputies responded to the crash. Photographs by state police and those posted on social media showed the front end of the state police cruiser had been crushed. There was also extensive damage to the cruiser’s rear end.